Android Masters, our collegiate inter-school Android app development challenge open to all universities and colleges across the Philippines, is now on its second year. We received a total of 193 app entries from 45 schools across the Philippines. We have selected five finalists each per category (games and productivity/utility) who will be presenting their apps on November 19, 2016 at Natividad Fajardo Auditorium in De La Salle University Manila. If you are interested to watch the presentations and support your school/team/apps, register now athttp://androidmasters.gdgph.org. The Firebase Dev Summit is a full day event for app developers that will focus on how to use Firebase with your apps. 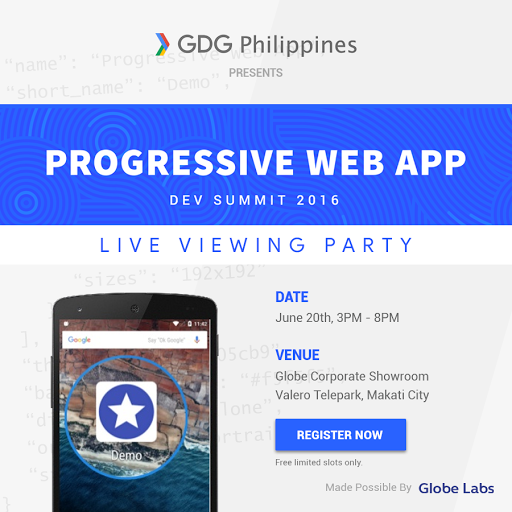 GDG Philippines is hosting a live viewing party on November 7, 2016 from 03:00 PM to 9:00 PM. Venue is at Mozilla Community Space Manila, Makati City. 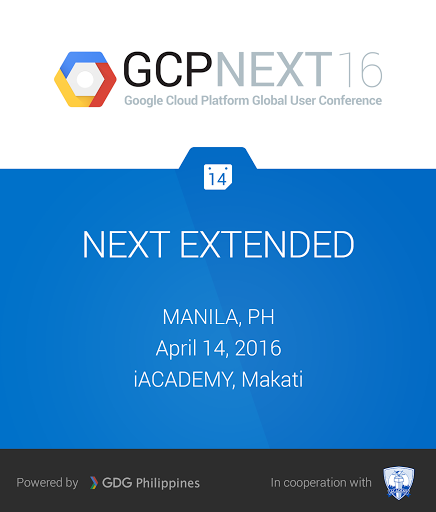 If you are interested to join, register now at http://www.gdgph.org/firebase-live-viewing. Ignite the Maker in You! Registration is now officially open for the most awaited Android Masters 2016. Android Masters is a collegiate inter-school Android app development challenge. It is open to all universities and colleges across the Philippines. The main objective of the program is to encourage students to develop their creative app ideas and publish it to Google Play Store. Google and the Chrome team will be hosting the Progressive Web App Dev Summit 2016 in Amsterdam on June 20th and 21st. The summit will be two days of talks, codelabs and access to the Chrome engineers to discuss the future of the web. 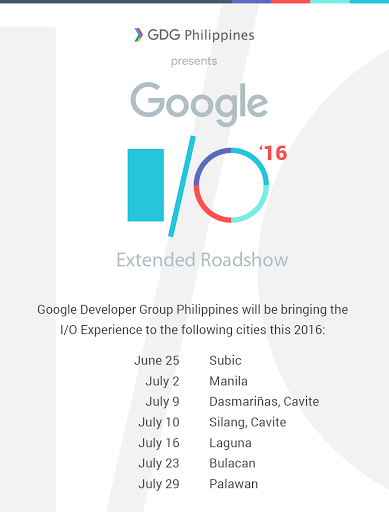 GDG Philippines will be organizing a live viewing party on June 20, 2016 (3:00 PM to 8:00 PM) at Globe Corporate Showroom, Valero Telepark, Makati City. Registration is free but slots are limited. Signup now at https://goo.gl/plv7Lk if you would like to join us. GDG Philippines is organizing Women Techmakers Manila 2016 at Teresa Yuchengco Auditorium, De La Salle University Manila on March 19, 2016. The goal of the event is to empower women to pursue their dreams and build tools that will change the world. There will be invited talks from different women speakers who are excelling in STEM - Science, Technology, Engineering and Math, technopreneurs, code labs, and breakout sessions. Stay tuned in for updates. 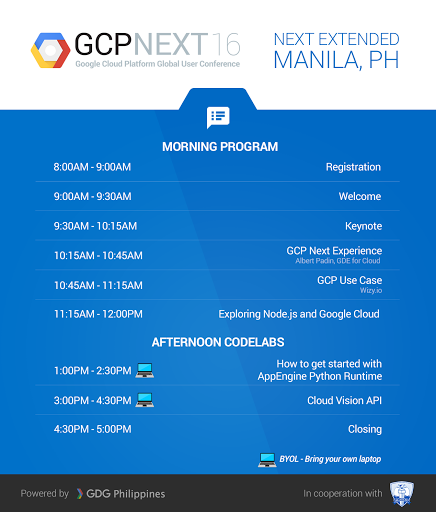 Add GDG Philippines in your Google+ circles and check the events website at http://womentechmakers.gdgph.org for registration and other details. The second Study Jams series is presented in partnership with Udacity and will follow their Android Beginners curriculum. If you are interested in the Android for Beginners Study Jams, join the live Hangout on Air on February 5 (7-8:30 AM, Philippine Time). Join the global Google Developers Study Jams Google+ Community and GDG Philippines Study Jams Google+ Community and post your questions there. Create your final project and prepare to present it to us. We'll be announcing details on project presentation/awarding. It's better if you will be able to publish it on Google Play Store. What will participants in the Study Jams get? Aside from mentoring from facilitators, they will also get completion certificates, schwags, discounts to the Android Nanodegree, and more if they will be able to present their final projects.